Indian aquatic culture has risen up in recent years, the output of aquatic feed over 1.5milliom tons in 2015, so the Indian market has attracted much attention. 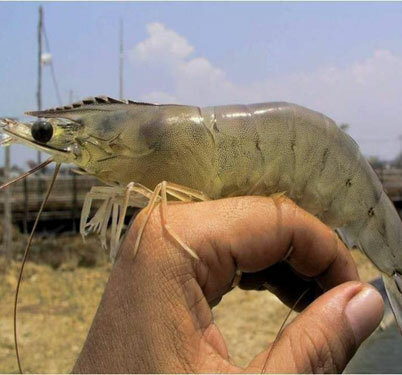 After the introduction of whiteleg shrimp, shrimp feed industry in India has undergone tremendous changes, new enterprises began to deal in the feed industry, the existing feed enterprises to expand production. India currently has about 25 aquatic feed enterprises, main feed enterprises are CP Aquaculture, Avanti Feeds, Godrej Agrovet, Growel Feeds, The Waterbase, Grobest Feeds and Nexus Feeds. CP Aquaculture and Avanti Feeds are the market leaders, the two companies sold a total of nearly 500 thousand tons of shrimp feed in 2014, CP is still continuing to invest in the construction of new feed processing plant, India’s demand for aquatic feed is increasing. Feed processing plant sell feed mainly in the forms of distributor and dealer, breeding enterprise directly purchase feed from the pant. Feed pants are also exploring ways to increase sales and market share with discounts. In India, feed can be sold on credit, if in a large amount of credit, many small feed enterprises are faced with a loss, and considering to sell the factory, only large feed enterprise with strong source of funds can survive. The price is different between credit and cash, the retail price of per kg Southern whiteleg shrimp is about $1.1-$1.4. Farmers pay cash to buy feed can have a discount of 10-15%. The content of crude protein in shrimp feed was 32-38%, and the fat content was 5-6%. Some enterprises produced sinking shrimp feed, but was not very successful. Feed enterprises pay great attention to the growth rate of shrimp, the feed conversion rate of shrimp farming in ponds was between 1.8:1 and 1.4:1. The quality of Indian domestic fish meal, bone meal and soybean meal is different, so the price is fluctuant, the best quality raw materials are mainly for export. Importing animal powder is not allowed in India, the import tax rate of soybeans, corn and wheat is up to 30-40%. Some raw materials such as squid powder, krill mill and soluble fish protein is very expensive because of procurement difficulties. In order to reduce costs, feed plant made a lot of concessions in the procurement of raw materials. Some small businesses do not use premix, some use livestock premix. Most of the brand feed have additives, but these plants use minimum dose cause the high price. The feed business for hatcheries are also growing, high quality shrimp, especially SPF, is in a great demand, there are hundreds of prawn hatcheries in the coastal zone of India. 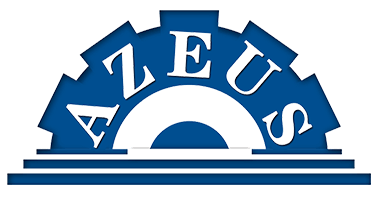 Feeds Zeigler (USA), INVE (Belgium), Biomar (Denmark) and Nutreco (Norway) and other multinational companies are selling incubation feed in India. TOKYO — Nippon Formula Feed Mfg. produced and sold feed for aquaculture in India in April 2015, as demand for seafood flags in Japan but grew rapidly in emerging markets. Nippai, as the Japanese firm is also known, will team with Indian feed manufacturer Shalimar Pellet Feeds to establish a joint venture, with each putting up half of the new company’s 220 million rupees ($3.86 million) in capital. The partners were expected to spend up to roughly 800 million yen ($7.55 million) on a plant to be built in the state of West Bengal, which is home to a thriving aquaculture industry. The venture sell feed for carp and whiteleg shrimp to local farmers, expecting to rake in sales of roughly 4 billion yen in fiscal 2018. India is the world’s third-largest producer of cultured seafood by volume, with carp accounting for roughly 90% of farmed fish, according to Nippai. Whiteleg shrimp is popular in Japan. With disease spreading among aquaculture farmers in Southeast Asia and China, India is emerging as an alternative site with rising output. 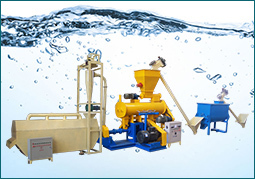 India has become the world’s second major aquaculture countries, the annual growth rate of aquaculture production will reach 8% in the next 5 years, floating expanded feed system is gradually combined with aquaculture technology. In addition to ensuring sustainable development of the aquaculture industry, using of floating expanding fish feed can make the fish grow faster, be higher yield, higher feed conversion rate and economic efficiency than the traditional feeding mode. Extruded feed is a kind of fluffy and porous fish feed, there are obvious advantages in palatability and the utilization of feed. 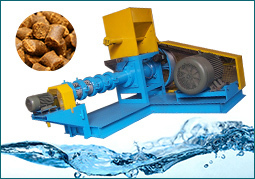 With the rapid development of aquaculture, the extruded fish feed has been vigorously promoted. At present, the expanded fish feed is divided into the expanded floating feed, the expanded slow sinking feed and the expanded sinking feed, most kinds of fishes like tilapia are suitable for the expansion of floating fish feed. First, expanded floating fish feed can float on the water for a long time, it is easy to observe and adjust the feeding amount when fishes are feeding. At the same time, the growth situation and health status of fish can be judged according to the feeding situation. Secondly, the extruded feed is through high temperature and high pressure to make the raw starch ripening, fat stability. At the same time, it harm and soften the fiber’s structure and cell walls, which improve the palatability and feed utilization rate. Compared with the powder feed, floating feed can save 10%-20% of the material. In addition, the expanded feed is also fragrant, which can promote the appetite of fish. 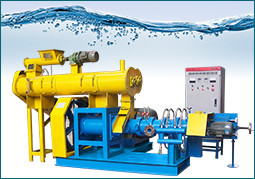 Thirdly, using expanded floating feed can prevent and control waste, effectively reduce the pollution of water quality. Floating time of high quality feed is in 12 hours, generally it can not be dissolved within 2 hours. Therefore, it can avoid the waste of the nutrient or sink to the bottom of the pond, and avoid the fermentation of the feed in the water, causing the pollution of water. Last, the water content of floating feed is low, it can be stored for a long time. At present, there are two kinds of main types of shrimp in the market, which are hard pellet feed and extruded feed. Hard particles feed mainly made through the flat die and szlh. Due to the simple structure of flat die pelletizing machine, the product quality is not high, and the yield is relatively low, so commercial hard particles of the shrimp feed is mainly produced through ring die pelletizing machine. In the processing, after crush and mix the material, starch gelatinization and protein denaturation in steam conditioning functions, the viscous force enhance between material, finally it was formed by the die hole and granulating machine-fish feed extruder. The raw material and formulation: silkworm excrement 2. 5%, rice bran 10%, wheat bran 10%, fish meal 48%, soybean cake 10%, beer yeast 2%, compound vitamin premix 0. 5%, mineral premix 1%, feed binder 15%. Starting Materials → mixing → transferring → extrusion puffing → transferring → drying → cooling → screening → spraying oil → seasoning → packaging. More information was provided in Processing Technology and Equipment for Fish Feed from the same site.